What better way to get inspired than to see lots of photos from gingerbread contests? Look at photos others have sent in or submit your own. We'd LOVE to see your favorite entries in your local gingerbread decorating contest! Of course, it doesn't have to be local either. If you traveled far to see a gingerbread house contest, tell us about it. Was it worth the trip? Wherever the gingerbread competition was, help us visit it vicariously through you by giving us lots of details. Did you come home and build your own gingerbread house? Did the judges pick your favorites? Did the room smell yummy? How many contest entries were there? Will you go back again next year? Have Photos from a Gingerbread Contest? This site is FULL of photos of gingerbread houses (and other gingerbread projects) for inspiration, but creative bakers raise the bar each year in gingerbread contests around the world. Please share photos you've taken at a gingerbread house contest. Title for this Gingerbread Contest Entry? Your photo and the story behind it will appear on a Web page the way you enter it here. You can wrap a word in square brackets to make it appear bold. For example [my story] would show as my story on the Web page containing your story. Want to Submit Multiple Pictures from one gingerbread contest? You can either enter them here one photo at a time OR just add each to your comments page - you can do this by adding your photos to http://www.photobucket.com, copy the html code they give you, and just paste it in your comments. You can even send in a slide show if you're really brave! Use rockyou.com or one of the other slide companies and then just copy and paste the code into your submission above. I DONATED OUR GINGERBREAD CREATION TO THE PRIMARY CHILDREN'S HOSPITAL HELD AT THE SOUTH TOWNE EXPO CENTER IN SANDY, UTAH. This school house is a depiction is of an old school house in my area. This is the winner or the 2008 George Brown College gingerbread house contest. It was created with a blue theme. My First Gingerbread House and Train! I Had a lot of fun doing this one the gum roof is made of big red gum. This is the inside view of the Gast Haus. you can see the tree and the fireplace. The floors are made of pastiallage. This Gingerbread B&B has a mountain and a stream by it.There is a loft as well. I created this out of my love for baking gingerbread houses. 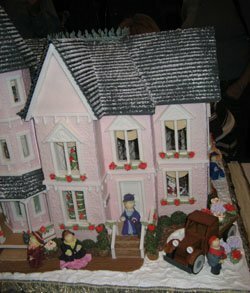 Here are some photos from past years of the createitwithgingerbread Gingerbread Log Cabin Competition in Nashville, IN. We are excited to visit New England this winter, this creation are thoughts of what may lay ahead for us in colder weather than here in Costa Rica. Made for the Chase School in Waterbury Ct.
Log cabin surrounded with small lake, well and just pure nature. A cuckoo clock in my house inspired my work on this one. I entered it in last year's annual contest put on by the culinary school I attend. I am Alyssa G. and I'm ten. I just made one with my dad and brother and so I really wanna post it because my family said its really good. This adorable gingerbread train was made by one of the kids at the National Gingerbread House Competition. This adorable yellow house was a winning entry in the 2009 National Gingerbread House Competition. Great details inside and out! Here's another beautiful Teen entry in the 2009 National Gingerbread House Competition at the Grove Park Inn. Really beautiful! I love the tin-looking roof! And the water wheel and chimney are yummy whimsical! And yet another winner from the teen division. This was one of my personal favorites. The up-close details were incredible!! WOW! Can't get enough of these? Check out these other gingerbread photo pages. Watch videos of gingerbread house competitions and winning entries. Host your own Gingerbread House Contest for family or friends. This link takes you to a page about hosting your own event.